Whether or not you are a J-pop fan or bargain hunter who has found a home in Daiso, Japanese products and culture has made its mark in Southeast Asia. Even during times of hardship, Japanese brands are often seen as thriving. An article on The Straits Times, shoved local Japanese retailers such as Owndays, Uniqlo and Muji into the limelight as it talked about how these brands are flourishing despite a declining retail sector. Clearly, the local market has a soft spot for all things Japanese. In 2015, Japanese ad firm, Hakuhodo, conducted its GlobalHabit study on the penetration of Japanese food, sake and green tea in 14 Asian cities. It found that Singaporeans aged 15 to 29 have been the most exposed to Japanese food, with Singapore itself ranked in the top five. The country itself sits above average against Asian countries in terms of trial of Japanese food, and that would mean that ultimately, Japanese food and Japanese infused food is intrinsic to local’s taste buds. This works well for Japanese brands and brands tapping into culture collaboration amongst many other things. Tanner Nagib, regional client service director at Hakuhodo, added that it will allow brands to be known for quality, superior technology, reliability, attention to detail, craftsmanship and trustworthiness. Capitalising on this trend are various global and local F&B chains. 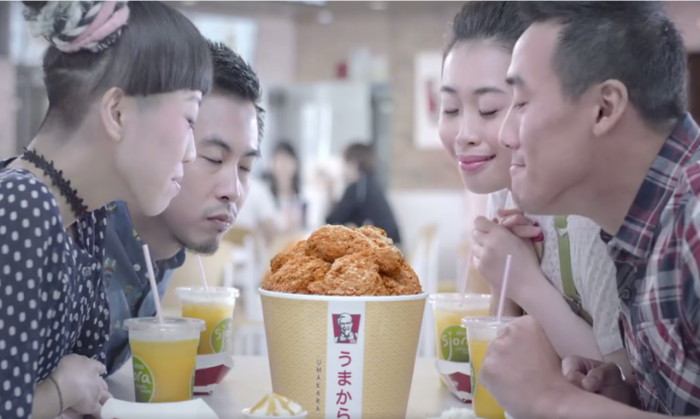 Most recently, KFC launched a campaign for its new Umakara Burger on both print and online. The burger ad has since gotten 1,569 Likes and 330,927 views. It also saw over 365 shares, 301 comments. Meanwhile, McDonald’s Samurai Burger is also known to have an impact on local diners as the burger is brought back time and time again. In fact, last year’s Samurai Burger relaunch reportedly topped organic social media reach for the fast-food chain in that quarter, said Yvonne Low, senior director – marketing, digital and menu innovation, McDonald’s Singapore. She added that last year’s Facebook teaser for the launch of 2015 edition of Samurai Burgers had the highest organic reach and engagement for the quarter, performing around four times better compared to the average reach of posts in the quarter. This was in comparison to other campaigns such as the launch of McDonald’s Clubhouse Burgers and McHappy Day. Low added traditionally, McDonald’s Samurai Burgers are among the most popular promotional menu items, and the brand frequently receives requests to bring the Samurai Burgers back on the menu. Singapore consumers are well-travelled and are getting increasingly sophisticated in their dining preferences, they desire choice and variety – Japanese flavours are just a part of this range. Meanwhile, a spokesperson from the brand, BreadTalk, also said that it is putting together a respected group of internationally renowned chefs and consultants from Japan to create new varieties in a bid to reach out to over 17 territories in Asia. The spokesperson added that its Hokkaido rolls have risen to become one of its top selling cakes. Tanner Nagib, in a conversation with Marketing, said the rise of Japanese-themed marketing coincides with many Japanese influences such as a counter culture from manga and anime to street fashion and in recent times – travel. “Japan is becoming one of the top choice destinations for Asian consumers. And when you think about it, this extensive exposure to Japanese culture and retail experience opens the flood gates to choice, beyond what we grew up with,” Nagib said. While leveraging on J-power is a highly credible and powerful route to take from FMCG to F&B, Nagib cautions that banking on it alone is uni-dimensional. According to Rob Doswell, CEO, McCann Singapore, the reason for the success of marketing with a Japanese theme could be due to Japan being seen as the Asian trend-setting market. “Korea and Thailand are influencers, but Japan still dominates trends and opinions,” Doswell said. Doswell however, cautioned that utilising Japanese themed marketing still needs to be taken on a case by case basis. Japanese theme or not, brands still need an idea, a solid mechanic and a string offer behind most themed promotions in order to elevate sales. As Singapore’s ambition grows, and as innovation becomes more rooted in Singaporean culture, Japan will continue to be a pull for the youth. Yuichiro Joshua Okada, head of business development, ADK Global, Japanese brands have also been successful in overseas markets predominantly for high quality and durability of their products. This is especially so for manufacturing brands such as Sony, Toyota and Honda. “In this era, the marketing strategies for Japanese brands were all about creating high quality products. Therefore, the foreigner’s image towards Japan has been skewed towards high tech and high quality for such a long time,” he added. Localised marketing has always been big in Japan. However in recent years, the trend has shifted and overseas markets are also embracing the culture, Okada explained. “Japanese-ness” is a value that is no longer linked by it’s heritage, but it is becoming a more open and universal value. Replacing her is Misty Maitimoe. ..
"Find a good female mentor who shares a similar vision, believes in you, gives you genuine advice, and always keeps you in check. "..